5 Bedroom House For Sale in London for Asking Price £3,250,000. A house in The Barbican offering an extremely rare opportunity for a family to enjoy living in the heart of the City of London. 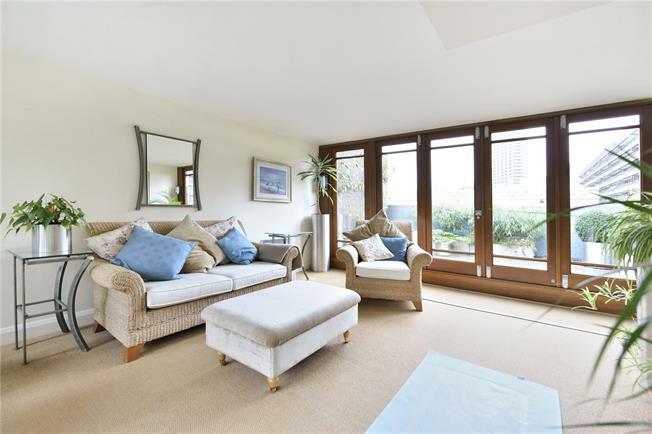 Set over five floors, this outstanding Grade II listed house is one of only 14 houses that form part of the highly sought-after Wallside part of the Barbican. The house offers five bedrooms, with the master bedroom suite on the third floor, and the option for one bedroom to be used as a home study or family/play room. From the superb kitchen and dining area one can see down to the living room, which provides an excellent entertaining space. The third reception room is at the top of the house which is full of natural light and offers two good sized roof terraces ideal for al fresco dining, for children to play or for a spot of planting. There is also a family bathroom, two separate W.Cs. integral garage and an abundance of storage throughout. Wallside is a terrace of fourteen town houses which face onto the beautiful private Monkwell Square, with parking outside. To the rear, the houses have a very attractive view over the Roman Wall and the lake which flows behind St Giles' Church. The property is perfectly located close to The Barbican Art Centre, famous for the many concerts, theatre shows, cinemas, art and other attractions it holds and has easy access to all the facilities of the Barbican, City of London and the West End. Families enjoy the acres of private Barbican Gardens and professionals have immediate access to extensive transport options including: Barbican, Moorgate for Metropolitan, Circle, Hammersmith & City, and Northern lines in addition to overground services, St Pauls for the Central Line; Bank for the DLR (City Airport and Canary Wharf) and Waterloo & City Line; Liverpool Street and Farringdon for overground, trains to airports (Stansted, Southend, Gatwick and Luton) and the highly anticipated Elizabeth line (Crossrail) with links to Heathrow in 30 minutes. There is no onward chain with this sale.